The swiftness with which the intensely destructive power of a tsunami can be visited upon geographically vulnerable coastal communities presents an awesome challenge to the national agencies and local authorities charged with emergency and natural disaster planning and operations. However, detecting and tracking a tsunami is a complicated task, one that requires the cooperation of the scientific community, as well as international cooperation between the states that are at risk. The tsunamis caused by earthquakes in 1960 (SE Pacific) and 1964 (NE Pacific) resulted in numerous human casualties and millions of dollars in damage to property and infrastructure in at least 4 countries. These disasters resulted in the establishment of the Tsunami Warning System (TWS) in the Pacific in 1965 under the leadership of the Intergovernmental Oceanographic Commission (IOC), and hosted by the American's regional Pacific Tsunami Warning Center (PTWC) in Honolulu, Hawai'i. The TWS is an international collaboration and has been designed to issue a confirmed tsunami warning less than an hour after the occurrence of a potentially tsunamogenic earthquake. The regional warning systems of Chile, France, Japan, the USA and the Russian Federation all contribute to the operations of the TWS. 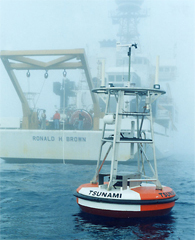 Although tsunamis are a relatively infrequently occurring natural disaster, and 85% of these events happen in the Pacific, the Indian Ocean tsunami (26 December 2004) that hit 11 nations, caused billions of dollars in damage and claimed over 250,000 lives clearly demonstrated that a vigilant warning system is necessary not only for the Pacific region, but for all the vulnerable regions of the world's oceans, including both sides of the Atlantic Ocean, the Mediterranean, Caribbean and Black Seas and in the Indian Ocean. In some of these regions, efforts have already been launched for the establishment of warning systems in these areas. IOC/ITSU, who operate the TWS in the Pacific provides information and guidance, and shares knowledge and experience with the IOC Member States of these regions. NOAA has taken on the task of increased capabilities for rapid dissemination of warnings in the near term to a longer-term goal of designing and putting in place a global tsunami warning and mitigation system. 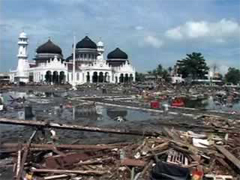 A further tsunami struck the south coast of Java, Indonesia on 17 July 2006. It was triggered by an undersea earthquake of magnitude 7.7 to the south of Java island. While the death toll is much lower than in the 2004 tsunami, at least 50 000 people have been displaced. An Indian Ocean tsunami warning system was being developed at the time. There do however appear to have been some alerts. An earthquake offshore of the islands of Samoa struck on 29 September 2009 and generated a major tsunami, resulting in death and widespread damage. Thanks to contributions from many Pacific nations, a warning system (triggered 16 minutes after the quake) enabled some to escape to higher ground, although the closeness of the quake to the land (25-30 minutes between the quake and the tsunami hitting) did not allow enough time for all to escape. The distance from the M7.7 earthquake epicentre on 25 October 2010 and the adjacent Mentawai Island chain is 40 km. Tsunami waves travel at speeds of up to 900 km/hr. The populace of the west-facing, low-lying ocean villages had less than three minutes to escape to higher ground. No one is to blame for not providing adequate warning - as there is no practicable way of evacuating hundreds or thousands of people from the potential tidal wave impact area on westernmost islands of Sumatra due to their proximity to the earthquake zone. What failed was the education process - only some of the people fled to higher ground and one of the boats put to sea immediately after they felt the strong earthquake - the right thing to do in these circumstances. Why wasn't everyone so well prepared to respond given the recent history of earthquakes and tsunamis in the region? Education is needed too. The first element of a tsunami warning system is monitoring: seismic monitoring and corresponding sea level monitoring. Another necessary element of a warning system is accessible data on previous tsunamis that can be referenced against the results of the seismic and sea level monitoring. Accordingly, the Historical Tsunami Database for the Pacific has been established and is maintained by the Novosibirsk Tsunami Laboratory of the Russian Academy of Sciences. Finally, a coordinated routine of communication between monitoring stations, the warning centre and at-risk states must exist to ensure the efficient information delivery of a tsunami warning system. The products of a tsunami warning system are accurate assessments and timely warnings, and while these products are fundamental to any disaster mitigation planning, a warning system represents only the first step on the precipitous road to tsunami preparedness. However, the more reliable and detailed the data from the warning system is, the more confident and precise the civil authorities charged with drafting and implementing corresponding emergency measures can be.